I first met Jane Siberry 10 years ago at a December 2000 performance of the Downtown Messiah at the Bottom Line. She had been joined on the stage by the Kennedys, David Johansen and Terre and Maggie Roche. I had been a huge fan of Jane's music for more than a decade earlier. I had made more tape compilations of Jane to share with my friends than any other artist in my diverse collection. I considered her music essential. It was at this performance in New York that I first talked with Terre Roche about the idea of having a series of house concerts in my back yard the following year. She and her sister Maggie agreed to help launch it. Pete and Maura Kennedy joined us as well with Groove Lily on another date of that summer in 2001. I was honored to host Jane Siberry at a very special concert in the beautiful Chagall/Matisse chapel of Union Church of Pocantico Hills, as well as help her with securing several other regional gigs on her visit from Toronto the fall of that same year. She had also been a guest at my home following the concert's reception. I am fortunate to be able to call her a friend, although it has been a long time since our last meeting. I feel a Jane Siberry show should be in the works as we celebrate 10 years of the evolution of the back yard concerts at Hammond House to a growing grassroots community of artists and patrons known today as Tribes Hill. This is an eclectic sampling I put together of some of my favorite Jane Siberry recordings spanning nearly 20 years. Be sure to visit her site from the link above; there is a bounty of music that Jane and I are both pleased and excited to share with you. Jane Siberry ( /den sbri/ JAYN SIH-bree) (born October 12, 1955 in Toronto, Ontario) is a Canadian singer-songwriter, known for such hits as "Mimi on the Beach", "I Muse Aloud", "One More Colour" and "Calling All Angels". She has also released material under the name Issa ( /isa/ EE-sah). Her music has drawn from a wide variety of styles, ranging from new wave rock on her earlier albums to a reflective pop style influenced by jazz, folk, gospel, classical and liturgical music in her later work. In May 2010 she made her entire back catalogue of music available as free downloads in MP3 and AIFF formats. Career history: Siberry was studying music and microbiology at the University of Guelph when she released her debut album, Jane Siberry, in 1981. The album was relatively successful for an independent release, but the follow-up, No Borders Here, was critically acclaimed and included the underground hit "Mimi on the Beach". The Speckless Sky (1985) was a commercial and critical success, and Siberry moved to a major label in time for The Walking (1988, see 1988 in music), which was a critical success but popular failure. The Walking was released on Reprise Records internationally, but remained on Duke Street Records in Canada. Reprise would become her Canadian record label as well with her next album, Bound By the Beauty, in 1989. In 1993 Siberry worked with Michael Brook and Brian Eno on When I Was a Boy. That album's most famous song, the k.d. lang duet "Calling All Angels", first appeared in Wim Wenders' Until the End of the World, and was later re-recorded for the Pay It Forward soundtrack. The album was noted particularly for its introduction of the more spiritually-oriented themes that have become a hallmark of her later work. Following the release of Maria (1995) Siberry founded her own independent label, Sheeba Records. She has released all of her subsequent material on that label. Her public profile has been lower since she became an independent artist; however, she retains a devoted cult following. All of her independent albums have presented material organized around a particular theme, such as Christmas music, songs about communication, or traditional spiritual music. Inspired by the dichotomy between frequent e-mails from devoted international fans asking her to play a concert in their city and her difficulty in finding a suitable concert promoter, Siberry launched a "microtour" through her fan mailing list in 2010, in which she offered to play small venues — ranging from intimate cafés to fans' own homes — in any location in Europe where one or more fans could organize a space, an audience of about 20 to 30 people and a night of accommodation. Issa: Early in 2006, Siberry closed her Sheeba office, then auctioned (via eBay) and sold nearly all of her possessions—including her home and instruments. She presently retains one travelling guitar, but none of the other instruments featured on her albums and in her concerts. In 2006, she told The Globe and Mail that she had kept a very few precious possessions, including her Miles Davis CDs, in storage. "I felt the need to make some strong changes in my life. It seemed important to change my name, so I did. I changed it to a name that I thought was simple, an empty cup. I had never heard the name Issa before, and it turns out to have some wonderful meanings, including a haiku poet in Japan, and the name that Jesus had in India. But two weeks ago I officially changed my name back to Jane Siberry. I felt with the name change, I had gotten in my own way, in terms of devoting myself to my career, making my work available to people. So, Jane Siberry is my name again until further notice, but I feel richer from having been Issa for three years." On June 3, 2006, somewhere in northwestern Europe, Siberry changed her name to Issa. She revealed her new name to the public on June 24, 2006. She indicated, however, that her older music would remain available for sale under the name Jane Siberry; only her new material would be released as Issa. She indicated to The Globe and Mail that she chose the name Issa as a feminine variant of Isaiah. On July 4, 2006, she gave a lecture at University of British Columbia in Vancouver on the topic of "Cracking the Egg: A Look from the Inside". She began with a poetic meditation on science and life, and then opened the floor up to questions from the audience. She talked about her recent adventures in decommodifying her life, her change in name, and her new conception of herself as an artist. In 2006 and 2007, she documented the process of recording some thirty new songs in her journal, posted on her MySpace page and on issalight.com. In autumn 2008 she finalized three albums. The first one is entitled Dragon Dreams, and was released on December 12, 2008. In 2009, she released With What Shall I Keep Warm?, with both names, Issa and Jane Siberry listed on the cover. 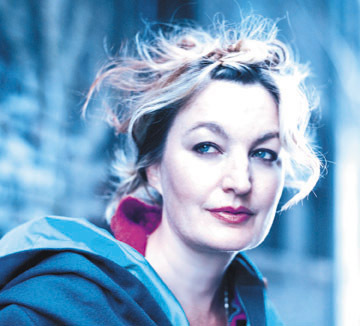 In December 2009, Siberry notified her fans that she had recently changed her name from Issa back to Jane Siberry. She is a vegetarian. Musical style: Her music is most commonly compared to artists such as Kate Bush, Joni Mitchell and Laurie Anderson. She has cited Van Morrison and Miles Davis as being strong creative influences. Siberry has often criticized the competitive power of commercial radio and the recording industry. In 2005, Siberry pioneered a self-determined pricing policy through her website on which the purchaser is given the choices of: standard price (about $0.99 USD/track); pay now, self-priced; pay later, self-priced; or "a gift from Jane". In an interview with The Globe and Mail, Siberry confirmed that since she had instituted the self-determined pricing policy, the average income she receives per song from Sheeba customers is in fact slightly more than standard price. Awards: On August 30, 2005, Jane Siberry was awarded the 2005 Victor Martyn Lynch-Staunton Award in music by the Canada Council for the Arts. A Collection 1984-1989 (1995) - North American "best-of"
Summer in the Yukon (1995) - UK-only "best of"
Covers: Her song "One More Colour" was covered by Sarah Polley on the soundtrack to The Sweet Hereafter, and by the Rheostatics on their Introducing Happiness album. k.d. lang covered "The Valley" and "Love Is Everything" on her album Hymns of the 49th Parallel. Rock Plaza Central covered "You Don't Need"; and "Calling All Angels" was covered by The Wailin' Jennys in 2009.